Someone recently asked me what, in my opinion, is the greatest health epidemic Americans are facing today. It didn’t take me long to answer— obesity. We are closing in on 78 million American adults and 13 million kids who are considered obese in the U.S.! Obesity, or being overweight, is defined as having too much body fat—it is the direct cause of consuming more calories than you will burn on a daily basis. Obese Americans are at an increased risk for some of the most critical health issues in the U.S. today, including high blood cholesterol, diabetes,and heart disease. Studies have even discovered that there is a higher stroke rate amongst overweight middle-aged women! In a research study presented at the International Stroke Conference in 2008, researchers analyzed data from two national health and nutrition surveys. The first survey took place from 1989 to 1994, and the second survey from 1999 to 2004. It was discovered that the stroke rate increased from 0.63% in the first survey to 1.79% in the second survey for women aged 35 to 54. Researchers soon found the link between a having a higher body mass index (BMI) and a higher stroke rate; they discovered that the women in the second (1999-2004) survey were more overweight than the women in the first (1989-1994) study. Researchers measured the BMI of each woman—this is the process of measuring body fat based on height and weight—and discovered that the average BMI for middle-aged females rose from just over 27 in the first study to 28.76 in the second study. 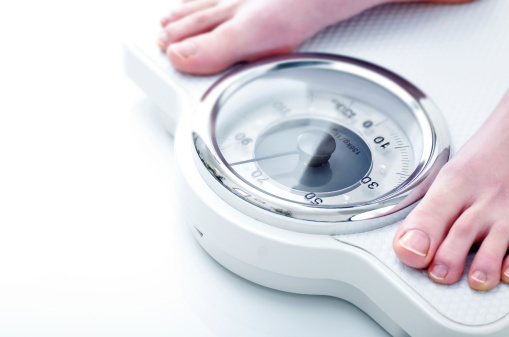 Keep in mind that an individual with a BMI of 25 to 30 is considered overweight, while over 30 is considered obese. • If you incorporate at least 30 minutes of daily physical activity into your family’s routine, you will see positive results. If you have children, ensure that they get at least 60 minutes of physical activity on a daily basis. The reason children need a longer amount of activity is because you don’t want them to develop bad habits at an early age. • I know that television has become easier to watch these days, but if you aim to substitute 30 to 60 minutes of television each day with some form of physical activity, you can greatly reduce your chances of obesity. If you can’t give up TV, then aim to do some form of physical activity while watching TV. • Whether you’re at work or at home, always promote healthier food choices for yourself and for those around you. For example, try and eat at least five to nine servings of fruits and vegetables a day. • Finally, in an effort to prevent overindulging, aim to eat about six smaller-sized meals throughout the day. This will keep you fuller for longer and you won’t feel the need to binge-eat later in the day. • It’s best to prevent obesity before children become adults. Schools can enforce existing polices from the U.S. Department of Agriculture; for instance, prohibiting serving foods of little to no nutritional value in vending machines and service areas. • In addition, schools can provide healthy food options for students, including meals that are low in fat and low in added sugars.